Asics RoadHawk FF 2 are neutral performance running shoes. The responsive Asics RoadHawk FF 2 keeps confidence on flagship material FlyteFoam™ while makes unclear the strategy from the japanese brand on performance running shoes: currently there are two models for neutral runners (current RoadHawk FF 2 and Noosa FF 2) and popular Gel DS Trainer 23 with mild pronation support. Most interesting thing in RoadHawk FF 2 is the midsole based on FlyteFoam™ Propel, a slightly firmer, more responsive and little bit heavier development from original FlyteFoam™. Most likely sales figures (and therefore retail price) will be definitive for Asics to decide in which direction to move regarding performance running shoes lineup. One of the most controversial change from the first edition of the Asics RoadHawk FF is the 20% weight increase which makes it heavier than its theorical bigger sibling Dynaflyte 3. Both shared similar modern and clean upper based on dual layer mesh but fit is tighter in RoadHawk FF 2 with special overlays around midfoot. As mentioned above, major highlight in Asics RoadHawk FF 2 is the first midsole completely made of FlyteFoam™ Propel which although heavier, is firmer and bouncier than FlyteFoam™ Lyte. 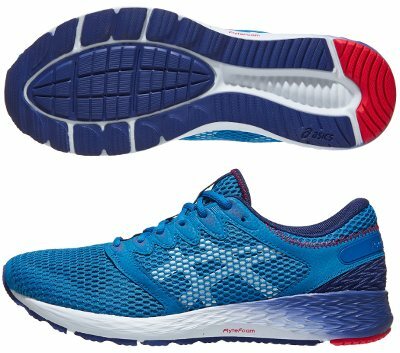 Combination of both was first premiered in premium Gel Kayano 25 and popular Gel Cumulus 20 but performance of one of them alone is something that must be backed by unbiased runners. Outsole provides full-length ground contact and forefoot configuration with main island isolated from border promotes quick and smooth transition. As usual, more robust rubber AHAR+ is used in more exposed areas to increase durability.